I love trying new foods for my kitties. I’m not one to stick with just one food. 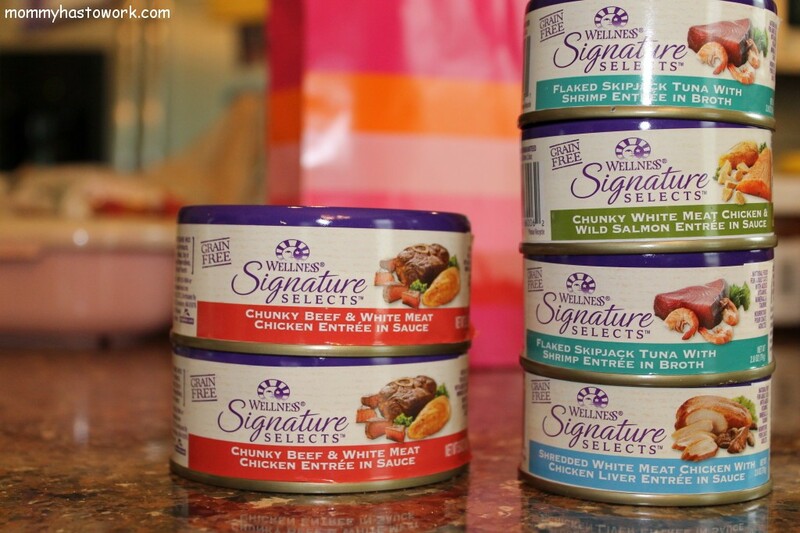 So when asked to try the new Signature Selects for cats I was excited for Zena and Spice. We received 4 different flavors from Signature Selects to try. Chunky Beef and White Meat Chicken in Sauce, Flaked Flipjack Tuna with Shrimp in Broth, Chunky White Meat Chicken and Wild Salmon in Sauce and Shredded White Meat Chicken w/Chicken Liver in Sauce. My cats are not big wet food fans but they do like a treat once and awhile. I like knowing what I do give them in chocked full of good foods. We tried the Chunky White Meat and Salmon in Sauce. They ate about half of the can. Next time I will only give them half and save the rest for another day. You can see the chunks o chicken in there, unlike some of those other brands where everything is mush. Check out Wellness on line and see all that they offer for your pets. They are on Facebook and Twitter too! On Pinterest? 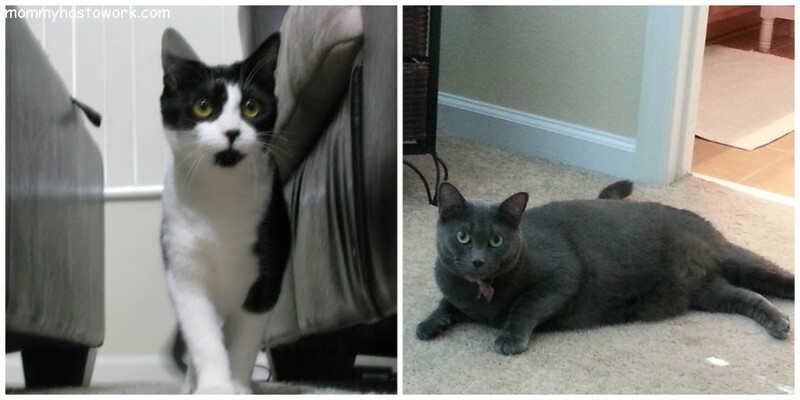 See their Pinterest page for some adorable pictures! I received the above product to try. All opinions are my own. Your kids don’t get mad when you change their food around? That’s nice! Those are quite full of nice chunks! No, they are pretty easy! I’m going to have to tell my friend about this! i know she’s looking for new food to try with her cats. Our cats would probably love this food, we haven’t given them canned food in a while and by the way I love your cats names! Cricket would love some! He only gets wet food for special treats and when he’s sick. My parents use wet food as an occasional treat for their cat Bob. I bet he’d love some tasty food from this line! If I fed the cats this and then went back to dry food, they would never forgive me. HA! 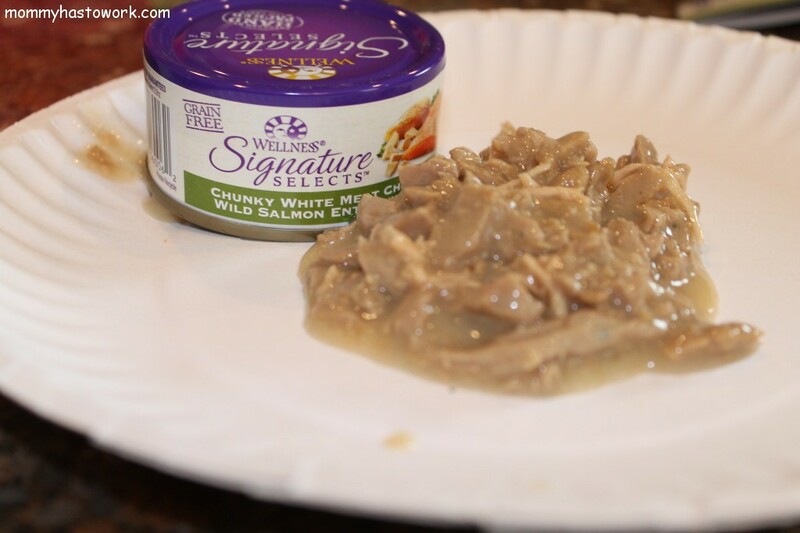 My cats eat dry food, but every once in awhile I give them wet food as a treat. I bet they’d love these! I think I’ll get this for my BFF’s kitty. We buy her presents–I know, it’s a bit silly but it’s fun. Thanks for the info on this cat food, my mother has two cats and I know she likes to feed them the best. Your cats would probably love living where I do – there is a cat food plant and occasionally we get to smell the aroma of fresh cat food.